Gmail has actually had this feature for quite a while. Just look at the bottom of your Gmail inbox, and you’ll see information about your last log-in. 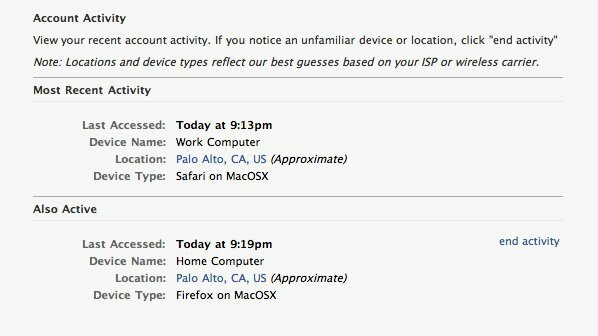 Click on the details link and a pop-up will display the last 10 logins, their associated IP address/location, and the last time activity occurred via that login. I am not a hacker and yet it is seemingly IMPOSSIBLE to get into My own Face Book. I got a new phone yesterday and I’ve forgotten my password and they haven’t sent a code for me to use!!! How in his world do I remedy this…About 85% of my network for business is on there.